I’m so glad my brother lives in Melbourne as that provided me with an excuse to visit when I was staying Perth. Hop on a flight and 4 hours later you’re in the wonderful city. He lives in Kensington, which is not too far out from the city. I did my research this time – last year when I visited, I didn’t do any and I definitely found it more enjoyable this time – snooting out the best cafes, lunch and dinner spots around the city. We only had 2 full days in Melbourne as we also took a trip to Mt Martha to visit my boyfriends family friends so we had a lot to cram in. Day one, the first brunch. 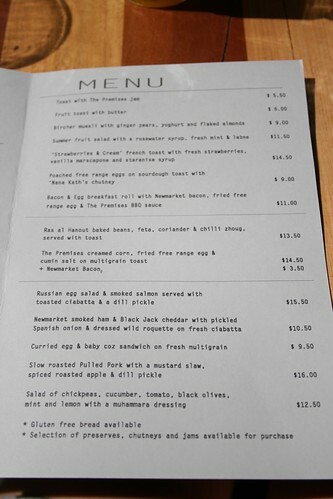 I wanted to go to Spinifex but it was closed over the Christmas and New Year period but luckily a new cafe has just opened a few doors down called The Premises. The cafe is not quite on the corner of the street – it takes up a lovely shaped space that nestles on either side of the corner shop. The cafe is furnished with old school desks and what looked to be reclaimed furniture (although most of which I believe was made by the owners dad!) The colour theme is green – the tiles and lamps and chairs are all a beautiful emerald green. First thing was first, a Flat White and a freshly squeezed Orange Juice was in order. The Coffee was absolutely amazing and sourced from Seven Seeds. I found that the best coffee in Melbourne seemed to be Seven Seeds. 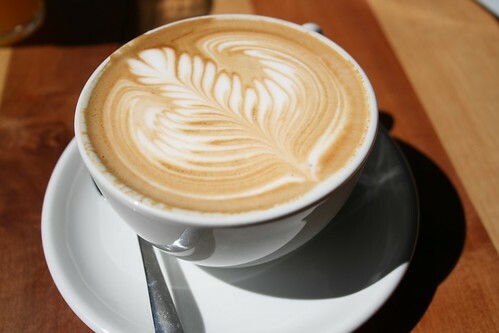 I know that a coffee is good when I don’t need to add sugar to it! The OJ was tangy and fresh as a daisy. 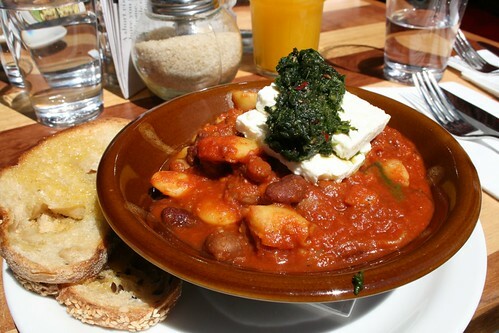 We then ordered a couple of dishes from the brunch menu – the Ras al Hanout Baked Beans, Feta, Corriander & Chilli Zhoug with toast and simple poached eggs on toast with ‘Nana Kath’s chutney’. I love the way that ‘baked beans’ don’t mean Heinz in Australia. Moreover, the beans are homemade with Butter Beans, Canelini Beans, fresh Tomato Sauce and a Chilli kick. This dish had added spices and a subtle heat from the Chilli Zhoug. I wished there was slightly more Feta cheese on the top but maybe that’s just my greed or because I was sharing. The Poached Eggs were cooked perfectly and I really enjoyed the chutney, which I would never had put on the side of this dish myself. The Premises was a great start to our Melbourne foodie adventure. I am so jealous of my brother, I wish that I had this cafe on my doorstep!